Jamie prepares to lead his people to war while Claire lives some unpleasant memories as Outlander starts to march towards the inevitable conclusion. 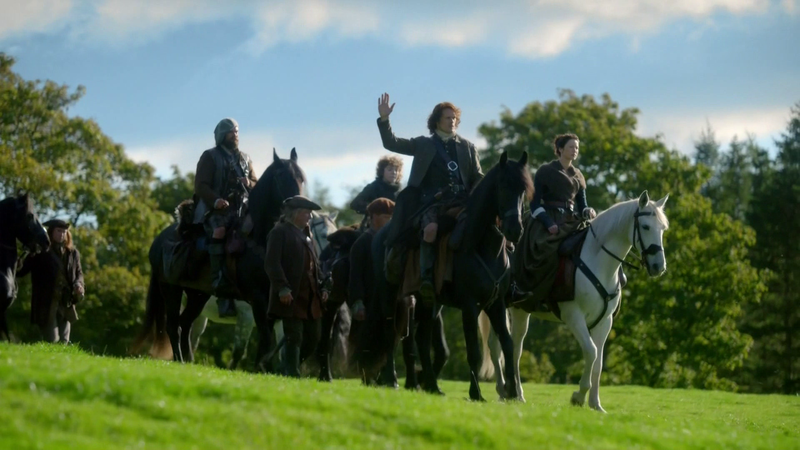 It has been made clear since the first episode of the season that, despite Claire and Jamie’s best efforts, the Jacobite uprising is doomed to failure so the lingering question has been how that happens and what causes their plans to fail so spectacularly. There are some early complications as Jamie has a small untrained army that has dwindled due to a lack of commitment from some of the men. Jamie is keen to work with what he has so they set up camp and train for their upcoming fight. 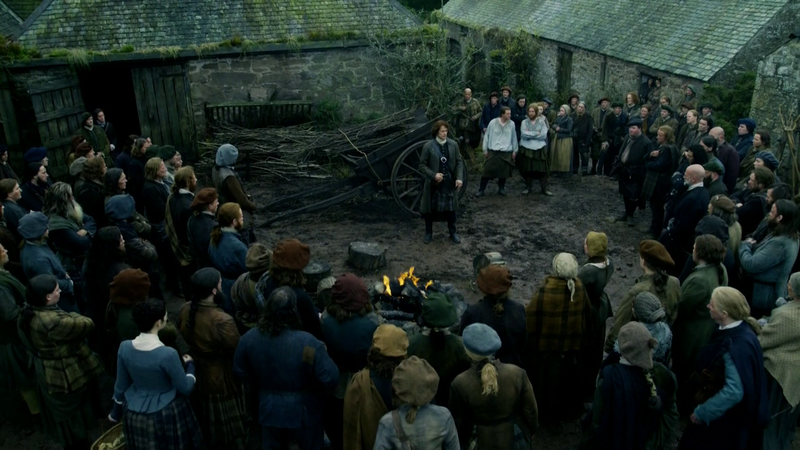 It would be easy for this episode to be full of training montages and inspirational war speeches without much depth but Outlander tends to be better than that. Those elements definitely come into play but they are secondary to the characters as usual. Having the preparations for the start of war happening all around her causes Claire to be reminded of her own experiences during World War II. Up until this point very little has been revealed about Claire’s time as a nurse during the second World War so it’s interesting and surprising to have the flashbacks appear now. The similarities between the upcoming conflict and World War II are striking. It’s clear that the writers are trying to make a point about War on a conceptual level and how it doesn’t really changes across the centuries. The way War is fought changes with better weaponry and the reasons may differ here and there but the effect it has remains the same no matter when it is being fought. This is expertly illustrated through Trench foot becoming the common thread that connects the two time periods. It acts as something of a trigger for Claire who experienced men afflicted by it during her time as a nurse and sees the same thing about to happen here. There’s a really powerful scene where she delivers a speech about how dangerous it is and how best to avoid it. The quick transition where she snaps at Rupert and Angus for making light of her advice landed perfectly and was appropriately jarring. It was interesting to get some insight into Claire during World War II. The version of Claire we see is familiar to us as viewers as her intelligence and confidence comes through clearly. She is also a little flirtatious which proves to disarm any tension that may exist in the situation. The flashback where she bonds with two American soldiers over how terrible the rations are was really well done and instantly suggests that something terrible will happen to the two soldiers. If Claire is distraught in her present over her memories then it can be easily assumed that it doesn’t end well for the two young men that she is suddenly reminded of. Structurally the flashbacks work well from the point of view of Claire’s emotional arc. As the episode goes on she continues to unravel and the flashbacks intensify as that happens. Eventually we see an attack that leaves the two men dead and Claire trembling in a ditch trying to close herself off to the horrors she experienced. This mirrors what is happening in her present as she is curled up on the ground trying not to hear the gunshots of the Jacobite soldiers preparing for their own War. Perhaps the Arrow writers should take note from this episode in making flashbacks relevant to the story being told. 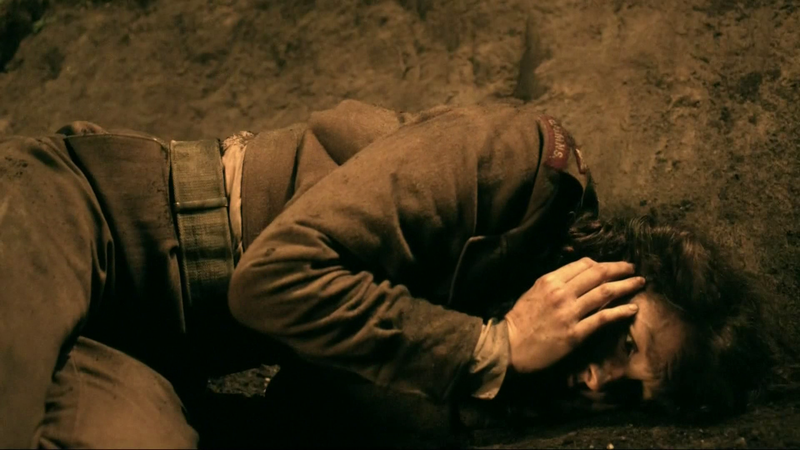 One thing that doesn’t quite work about the flashbacks is that the focus on Trench foot doesn’t quite pay off. Considering how prominent it was throughout the episode I expected it to relate to the American soldiers in some way beyond Claire giving similar advice in the two time periods. I guess saying that two soldiers got Trench foot wouldn’t be as impactful as Claire witnessing their deaths in a surprise attack. It does cleverly create a powerful sense of guilt for Claire as a healer who could do nothing for them. The flashbacks also have a sense of inevitability about them just as the scenes set in Claire’s present do. We know that something horrible will happen to the American soldiers and we also know that the rebelling ends in failure. It seems that almost everything this show is doing attempts to hammer home the fact that the rebellion won’t be successful. Is it overkill? Maybe but it definitely gets the point across. In true Outlander tradition it is Jamie who notices what Claire is going through and is able to make her open up about what is troubling her. It’s a touching moment and another example of the close connection these two characters have. 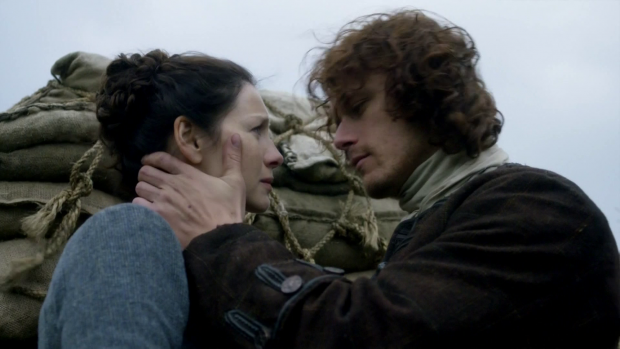 Sam Heughan is compassionate and sincere when he promises Claire that she will never be alone like she was in that ditch after the soldiers were killed. We know that to be untrue because we have an idea of how this ends up but the important thing is that Jamie means what he says and that his promise is a genuine one. Sometimes circumstances prevent people from keeping a promise they fully intend to keep and this is a good example of that. 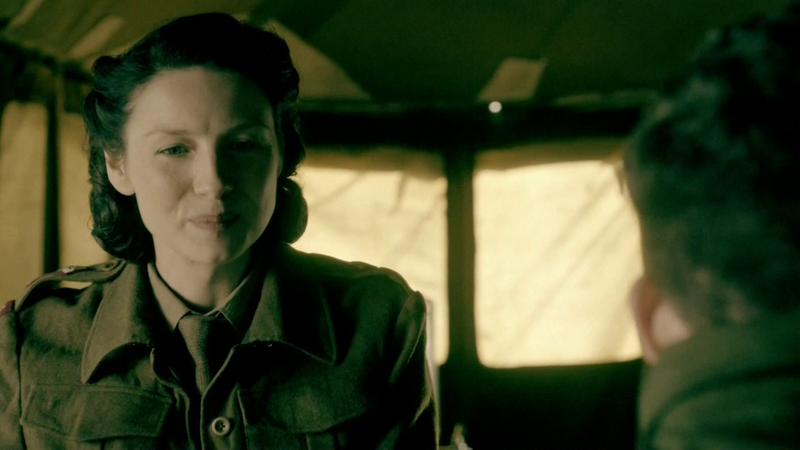 Caitriona Balfe delivers another amazing performance when she describes the horrors of what she experienced to Jamie. The point she makes about watching history repeat itself and how powerless she feels to do anything about it is chilling. Jamie’s role in the episode is a bit more muddled in ways that both work and don’t. Sam Heughan throws himself fully into portraying Jamie as a strong and confident leader who is able to inspire the respect of his men but there is a sense that Jamie is good at whatever the show needs him to be good at. In Paris he was a shrewd political operator, in the previous episode he was skilled in a very different type of politics and in this episode his skills have been extended to being a respected and skilled General. 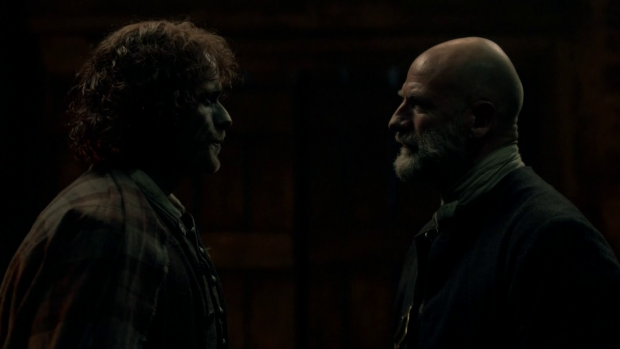 His conflict with Dougal helps to illustrate this as in the last season Dougal was the one who gave Jamie orders but now it’s the other way around. As expected this isn’t something Dougal is comfortable with and he spends all of his time trying to undermine Jamie’s leadership by making his men ignore the advice with demonstrations that disregard strategy. After Jamie tells him to either obey his orders or go somewhere else Dougal goes behind his back in an attempt to get Claire to betray him but he doesn’t account for how strong their relationship is and his plan fails. I found it hilarious that he tries to remind her of their pact from last season despite the fact that it really doesn’t apply here. It’s pretty consistent for Dougal to try to exploit a situation but surely even he should realise he’s fighting a losing battle here and he should definitely realise that Claire would have told her husband about it. Claire’s reaction to this is brilliantly done with reference to the Greek Myth of Narcissus and how that reminds her of Dougal. He is well and truly defeated in this episode and it’s really fascinating to watch. Despite how slimy and duplicitous Dougal is I can’t help but enjoy him whenever he’s on screen. A lot of it has to do with Graham McTavish’ excellent performance. Dougal’s lack of acceptance of Jamie as a leader does have a lot of basis though. It’s not a role I’m comfortable with him having at this point considering there has been little shown of it in the past. It doesn’t help that he seems oddly distanced from his actions in this episode. His speeches are booming and inspiration for sure but I didn’t feel the weight of what he was delivering despite the fact that most of them come from a very personal angle for Jamie. His leadership is also shown to be harsh but I’m not entirely sure why since Jamie has always been a compassionate man so it would stand to reason that this would extend to him being a leader. Perhaps him being unwilling to do what really needs to be done could be a big part of the defeat but instead he seems like a seasoned General who is all too happy to punish his men. The most glaring example of how detached Jamie seemed to be from everything was him ordering his men to be whipped. Considering the scars he has on his own back shouldn’t he be more reluctant or at least regretful at ordering this done to others? He knows how difficult it was for him to deal with being whipped so why would he be so quick to force this on others? When he submits himself to be whipped that should have carried significant emotional weight for him but it was shrugged off. Maybe this will be raised in later episodes but it does feel like the time has passed. A great episode that explores the horrors of War from the perspective of Claire who lived through one in the future. Showing how similar the problems are between the two time periods through Claire’s flashbacks was expertly handled and put the point across wonderfully. Jamie’s role in the episode was somewhat muddled with a lack of emotional connection to his actions but his conflict with Dougal was really well handled.